Disclaimer: all products reviewed in this post were purchased fully by me. 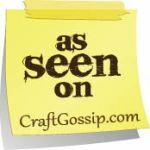 This review was not requested by anybody and no compensation has been received. 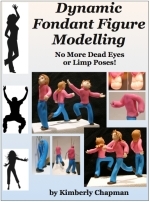 However, I am an acquaintance of the owner of Dinkydoodle designs and she has in the past given me another product as part of a demonstration I participated in. Between the new podcast and my regular busy life, it’s been hard to find actual cake decorating time lately. 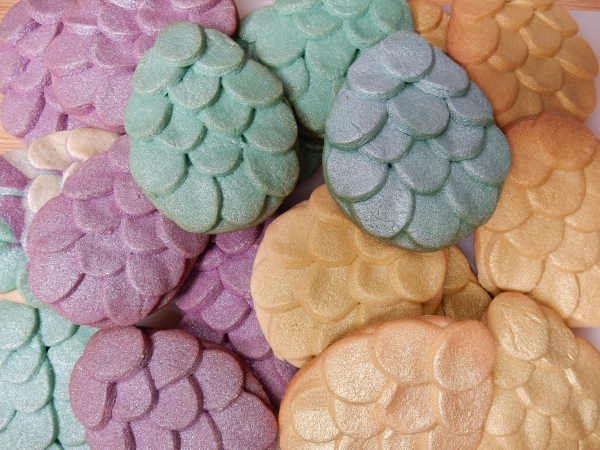 Ages ago some friends and I planned to get together for the launch of the new season of Game of Thrones, and I had all of these grand ideas for fun, decorated bakes to bring. But then reality hit and I needed to make something fast and easy. 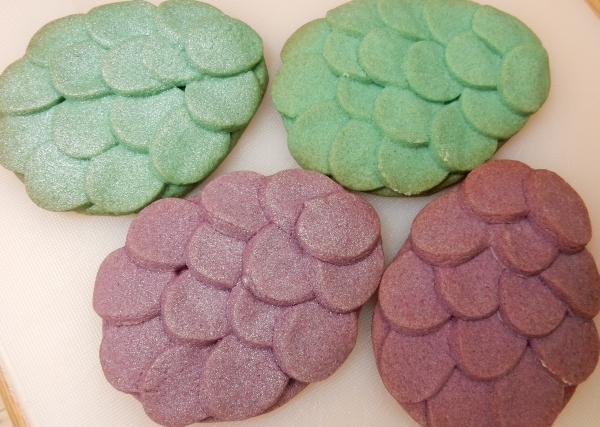 So I Googled around and found a lot of variations on making dragon egg cookies by basically cutting an egg shape and then either putting on fondant scales after baking or laying on extra cookie scales before baking, such as this tutorial from Otaku Crafts. I figured that’d be a good experiment to run with my new favourite no-spread, UK-friendly recipe basic sugar cookies from The Pink Whisk (because as I keep mentioning on the podcast and in my own chocolate rolled cookies recipe, differences in flour and butter between the US and UK make swapping recipes tricky when you’re trying to avoid spread). It helps that the Pink Whisk recipe doesn’t require chilling, and my friends keep saying they love the shortbready goodness of the cookies, so it meant I could make everyone happy with minimal time involved. I decided to gussy up the dough by colouring two thirds of it green and purple, and then left the last third natural, thinking then I could just finally crack open the bottle of Dinkydoodle Silver Glitter Airbrush Paint I’d purchased some time ago and give it a go. I didn’t have an egg cutter large enough, so I used one of the Ateco ovals and trimmed the tops. It didn’t have to be perfect, because I then used one of the smaller Ateco ovals to cut the scales and layered them on from the bottom up. I rolled my dough thinner than usual for both so the resulting cookie was slightly thicker than usual, but not fully doubled. The dough stuck nicely to itself with a bit of a firm push and didn’t need water or anything. Other doughs might require water. Glittered cookies on the left, plain cookies as they came out of the oven on the right. Even in close up the photo doesn’t do the sparkle justice, but you can definitely see the difference. It didn’t show up as well on the light colour of the natural dough as it did on the tinted dough, though. 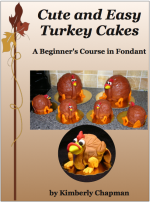 So I would expect it probably shows up better on darker fondant or chocolate versus lighter colours. That’s to be expected with a light glitter. 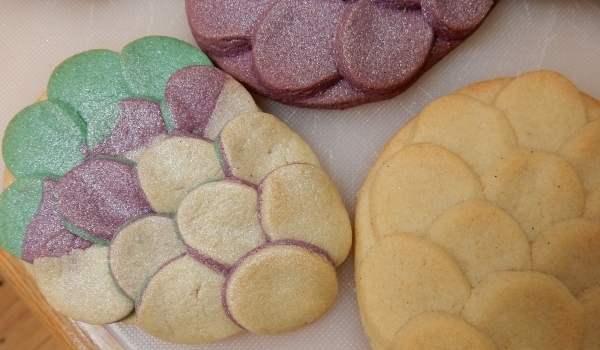 On the left is my scrap-dough cookie with glitter sprayed on. At the top is a glittered purple cookie. 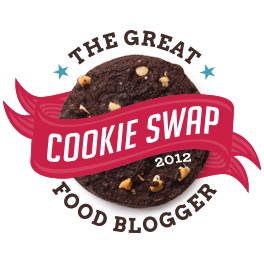 On the right is an unsprayed natural cookie. 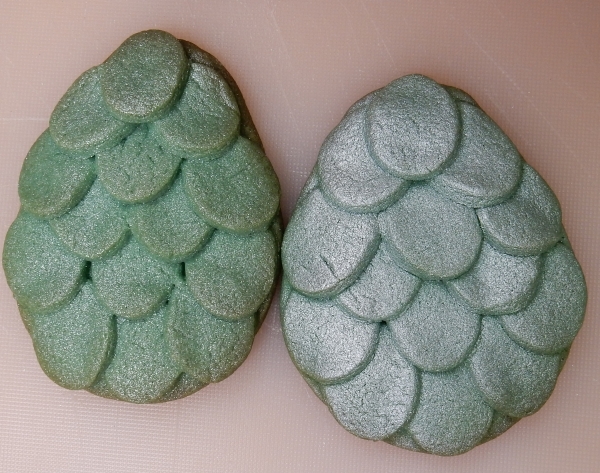 The left cookie has the glitter, the right has the pearl. You can clearly see how the pearl is shiny but whitens the colour overall, whereas the glitter makes the original colour sparkly but doesn’t really affect the colour itself much. This is really cool because it gives decorators an option to add sparkle without whitening, whenever that might be desired. And happily, the particulate was fine enough that it didn’t clog my airbrush at all, and my airbrush is not a Dinkydoodle model. 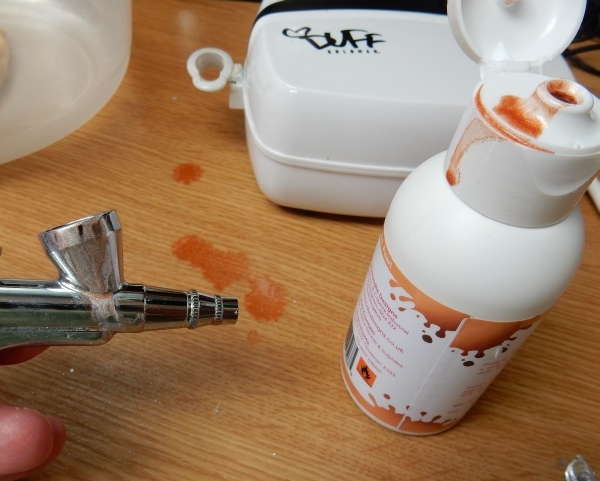 So as with any airbrush paint, as long as you properly and thoroughly clean your airbrush after you’re done, it shouldn’t cause any problems relative to any other colour. Plus it’s SO FAST compared to brushing on glitter. However, there was a downside. As much as I was gleefully, squeefully happy with the glitter paint, I got really frustrated with how it slopped all down the side of my airbrush cup. I thought at first that I must be even more tired than I thought, but then I was more careful and it kept happening. And when I switched to the Americolor gold, it didn’t happen at all. No matter how careful I was, it dribbled down the side of the airbrush and all over the counter. I examined the Dinkydoodle bottles in comparison to the Americolor bottle and realized that the Americolor bottle has a significantly longer pour spout, and with a straighter edge. 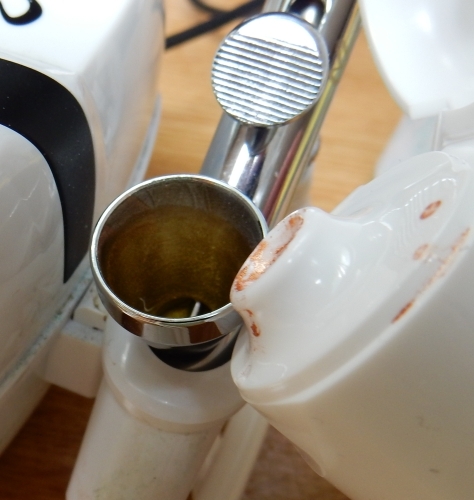 This means the Americolor spout hangs cleanly over the edge of the airbrush cup, whereas the Dinkydoodle bottle leaves too much gap and allows for dribbles. It’s likely that when the Dinkydoodle bottles are less than half full and can be tipped up more, they will dribble less, but with that curved plastic they may continue to dribble anyway. The Americolor bottle’s spout easily clears the lip of the airbrush cup, meaning all of the paint cleanly goes into the cup. 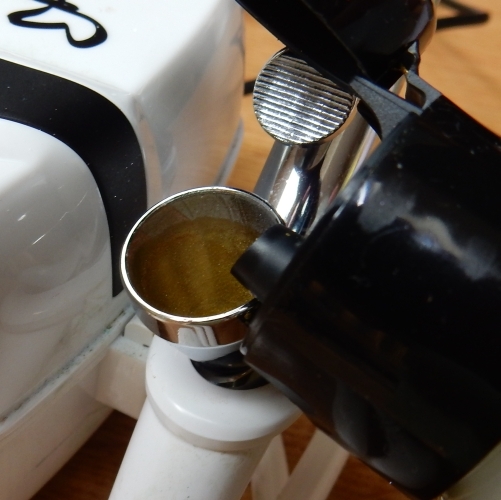 The Dinkydoodle spout is shorter and has a less defined edge, so the liquid is more prone to running down the lip of the cap instead of into the airbrush cup. These were my first experiences with Dinkydoodle airbrush paints since I still have so much of my old Americolor that I’ve had for years, so I don’t know if this cap style appears on all colours. I’ve had the Dinkydoodle Pearl colour around for longer and hadn’t yet opened until this test, and it appears to have a plain screw top bottle. While this takes a bit more care to use than the Americolor spout, it was much, much cleaner than what I am guessing is the newer cap design for Dinkydoodle. And in fact the newer cap does screw off, so for the remainder of these bottles I’ll just screw the drippy lid off each time. The Dinkydoodle Pearl is on the left and the Bronze Pearl is on the right. The Pearl was purchased about a year before the Bronze, so I’m guessing they’ve changed cap style since. 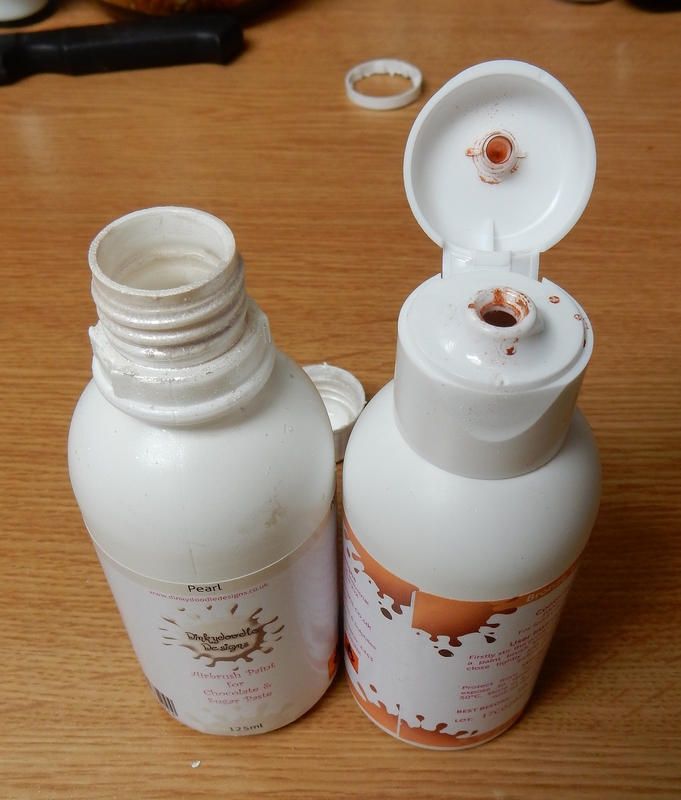 As mentioned, I’ve had the glitter and bronze pearl around for several months at least so it’s possible this problem has already been noted and fixed on even more recent bottles, and the obvious workaround is to just screw the lids off. I recommend others do the same to avoid mess and waste. So my conclusion is I really, really, really love the silver glitter airbrush colour. 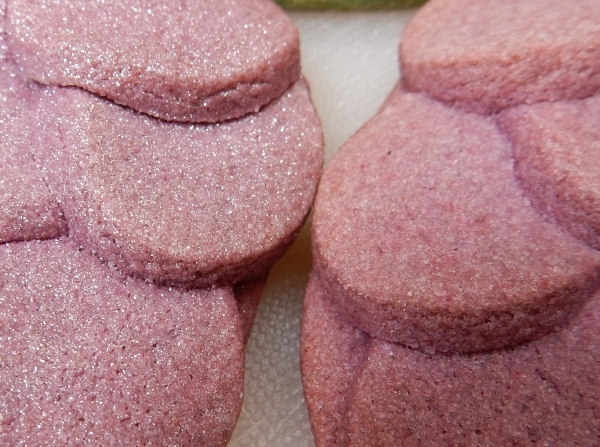 It is super happymaking in adding fast, edible glitter to projects. The pour spout across the line is problematic, but there’s a workaround. Hopefully they improve the caps soon, but otherwise the ability to quickly spray glitter is a definite plus! If I learn about an improved cap, I’ll update this post as soon as possible. 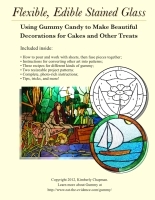 This entry was posted in Cake Decorating, Cookies, Products, Severe Nerdery, Tool Reviews. Bookmark the permalink.